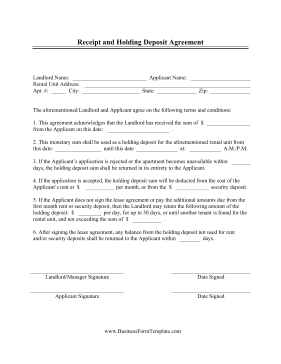 The receipt and holding deposit agreement in this free printable is provided so that an applicant for a rental unit can reserve an apartment or house by putting down a deposit while obtaining the rest of the money. If they do not pay or sign the lease within the provided amount of time the money is forfeit and the potential tenant releases their right to the unit. 2. This monetary sum shall be used as a holding deposit for the aforementioned rental unit from this date: _____ until this date _____ at: _____ A.M./P.M. 3. If the Applicant's application is rejected or the apartment becomes unavailable within _____ days, the holding deposit sum shall be returned in its entirety to the Applicant. 4. If the application is accepted, the holding deposit sum will be deducted from the cost of the Applicant's rent at $_____ per month, or from the $ _____ security deposit. 5. If the Applicant does not sign the lease agreement or pay the additional amounts due from the first month rent or security deposit, then the Landlord may retain the following amount of theholding deposit: $_____ per day, for up to 30 days, or until another tenant is found for therental unit, and not exceeding the sum of $_____. 6. After signing the lease agreement, any balance from the holding deposit not used for rent and/or security deposits shall be returned to the Applicant within _____ days.